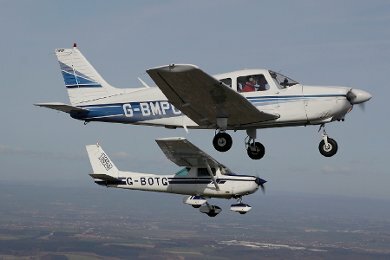 At Donair Flying Club we are uniquely placed to offer both flight training and aircraft hire from a friendly club environment at East Midlands Airport near to Nottingham, Leicester and Derby. We offer trial flights / trial flying lessons and flight training for the Private Pilot's Licence (PPL), Night Rating, Instrument Meteorological Conditions (IMC) Rating, Multi Engine Rating, the Flight Instructor Course and new for 2013, the Flying Compendium. We specialise in arranging courses to fit the student's own personal requirements, in addition to the full and part-time courses run seven days a week throughout the year. 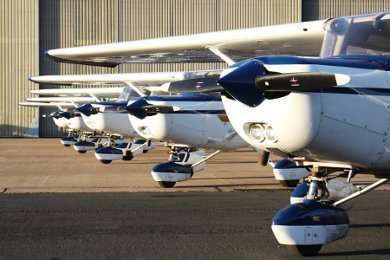 Operating from East Midlands Airport, enables Donair Flying Club to take full advantage of the wide range of facilities offered by a large International Airport. For example: Instrument Landing System and Radar Coverage for instrument training, customs facilities for international flights and 24hrs, 7 days per week operation. Donair Flying Club operates a modern fleet of aircraft, ranging from the popular Cessna 152 trainers to twin engine touring craft. Our own highly skilled engineers maintain all of the fleet. Clubhouse with lounge and breakfast bar. Friendly club environment, always welcome to call in for a coffee! All club aircraft hangared year round. AVGAS & Jet A1 + AL48 available - please inform ATC upon arrival and taxi to the maintenance area. We can also refuel on the main apron if necessary. Wide variety of membership base in terms of both experience and age. Best wishes and thank you for your interest in Donair Flying Club. In addition to the extensive range of flight accessories and products stocked in the clubhouse all "Pooleys" products can be purchased via their website www.pooleys.com all Donair East Midlands members will receive a 5% discount on orders made direct through Pooleys when you quote the code DONAIR001.